Last Name: WIMAN First: William Middle: A.
VARNER Loved ones rest in peace. Ledger Notes: Name in the ledger is "Phillip"
Monument Material: Marble monument with perhaps a concrete apron. Last Name: WOOD First: Alice Middle: C.
Last Name: WOOD First: Aubrey Middle: A. Notes: Son of John & Jane Wood. Husband of Inza R. Wood. He inherited the family farm on Corral Creek on Graham's Ferry Road. Husband of Inza Wood. Their house still stands, replacing his parents' home which was flooded to the second story in Big Flood of 1898 (?) and later burned. Inza was a teacher at Corral Creek School in 1930's, later teaching at Wilsonville School. Corral Creek School was a 1-room schoolhouse located just north of the intersection of Graham's Ferry & Wilsonville Road. There was a hand-dug well, but the children carried drinking water from a spring on the Wood farm (the spring still exists). Aubrey raised hops during the 1930's (hop house was razed in 1980's) and planted one of the early filbert orchards in the Valley, which still stands. Their barn collapsed in the Columbus Day Storm in 1962. Their farm was the site of an early oil exploration drilling which resulted in discovery of only an artesian water well, which still exists, though the artesian reservoir has been nearly depleted. No oil was found & the local farmer investors lost their investments. Contributed by Stephen Baker can be reached at 310-490-8510 or email sgb90210 at aol.com. Last Name: WOOD First: Hiram Middle: E.
Notes: Son of John & Jane Wood. No record of this person in the ledger. Last Name: WOOD First: Inza Middle: R.
Notes: One of the first teachers in Wilsonville. Taught at Corral Creek School and at Wilsonville Grade School for many years. Wood Middle School is named for her. Wife of Aubrey Wood. Last Name: WOOD First: John Middle: N.
Last Name: WOODRUFF First: Harley Middle: E.
G. L. Worth was born in Cook County, Illinois, Sept. 3, 1865, living there until 1886. He was married to Jennie Sprouls Dec. 16, 1886. They went to Wymore, Nebr. early in 1887 where he was electrician for the C.B.&Q.R.R. Co.: from there to Lincoln, Nebr. in 1906; from there to Sheridan, Wyo. in 1910 as Electrical Engineer for Acme Coal Mining Co.: from there to Sherwood, in Feb., 1916, farming until Jan., 1918, when he became Manager of the Sherwood Telephone co. He had been failing for the past three months with progressive paralysis and died at 4:10 P.M. Aug. 5. Funeral services were held by a Christian Science Reader in the Friends Church, Aug 8th. Interment was made in the Hood View cemetery. He is survived by widow and three daughters, Miss Helen Worth, Mrs. C. I Haywood, of Sherwood, Mrs. W. A. Davis of Sheridan. Mr. G. L. Worth was held in high esteem by all who knew him. "Mourn not the last! in realms of changeless gladness, Where friendship's ties are never crushed and broken, we still may meet: He who beholds our sadness. Hath to the trusting heart assurance spoken of that blest land, where free from care and pain, Fond friends unite again." Monument Material: Marble monument and plinth on a soapstone base with a concrete apron. Monument Problems: Minor chips on base and apron; apron is cracked. Vinca is impinging. Engraving: Legibility reduced due to wear and lichen staining. Illustrations: Center urn with palm fronds and the Woodman of the World insignia. 1865 - 1918 JENNIE H.
Last Name: Worth First: Jennie Middle: H.
Possible Pioneer Listed as South half of Lot #210. 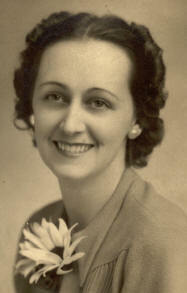 GG-granddaughter of Sobrina J. Russell.